Crystal's Crafty Creations: Happy Spring and MORE CANDY!!! Happy Spring and MORE CANDY!!! Good Morning Everyone, Happy Sunday!! I hope everyone is having a GREAT weekend!!! Before I get to my creation today I have some yummy low calorie candy up for grabs!!! I am offering up two BRAND new Images by Victoria Case for SCACD!!! The images are Call Me and Flora Bonita. 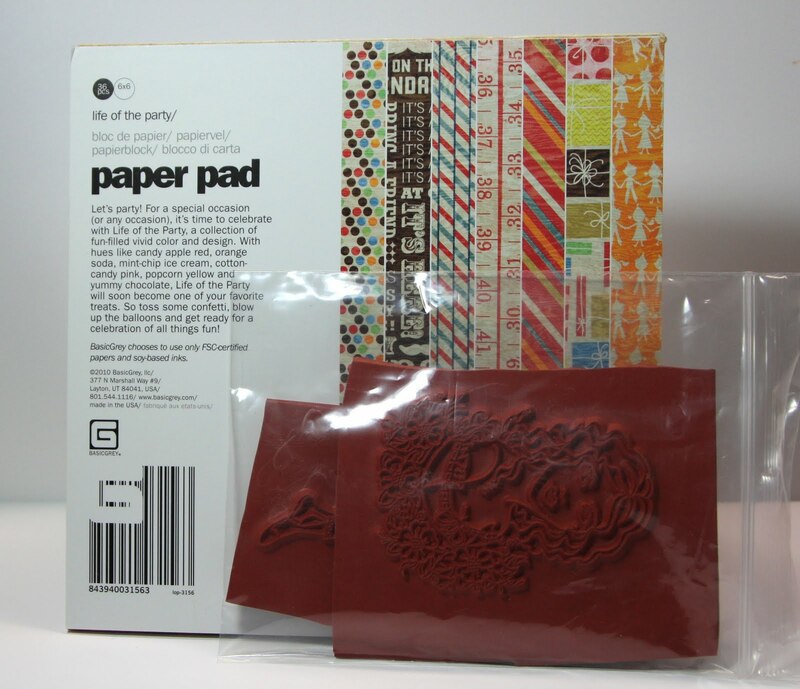 I am also throwing in the BRAND NEW Basic Grey Pad Life of the Party!!! The only rules of this candy is to check out SCACD's NEW CHALLENGE BLOG HERE!!! Once you check it out and become a follower only if you want to, just leave me a comment below and tell me you stopped by the new challenge blog!!! You will soooo want to become a follower because you could have a chance to win the NEW 2011 Copic Colors over at the NEW SCACD Challenge Blog!!! WOOT!!! You have until April 5th Midnight Eastern Time to enter this candy!!! 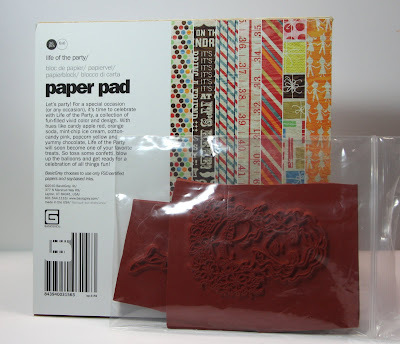 I will announce the lucky winner here at my blog April 6th... Good Luck to everyone!!!! I also wanted to share a creation with you today that I made with this GORGEOUS image Scarlett Bonita.... Hope you enjoy my creation today!!! Isn't this image soooo beautiful?? I decided to THINK SPRING today, I am sooooo ready for it to warm up and feel like spring outside!!! 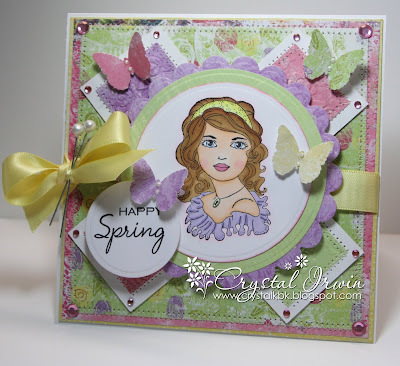 I also used this GORGEOUS designer paper Sweet Fairy, I just love the colors in this pack!!! Thanks so much for stopping by today!! I hope everyone enjoys the rest of their weekend!!! I love the new blog. Beautiful card!!! Thanks for playing along with our Sentiments card. I have joined the new challenge blog, but am stumped as to what the second prize is. Beautiful card, love the soft colors. Thanks for joining us at Do You Stack Up. ooooooo low cal candy! now THAT'S yummy! i've been a follower from the git-go! absolutely gorgeous card! that image is stunning and your coloring is wonderful!!!! Love your card and I'm an excited new follower!! What gorgeous card Crystle and in such beautiful colours, love the design.Love the new challenge blog and I have now added it to my list and become a follower too, great place with sneek peeks. Oh candy too how fantastic, thanks for the chance. Wow beautiful card. Thank you for the chance to win some blog candy. Hello Crystal. Such a beautiful and verty delicate card. Love all the pastel colours and the cute image. Adorable little butterflies too. Thank you for joining us at Tellens Place and good luck. Yahoo...I am all about BG candy! I need some Copic inspiration today since I am playing and this is great (love the springy colors). Tell the SCACD folks to do some sketches so I can link 'em up! I've joined the new challenge blog. Thanks for the chance to win some candy. Already a follower of SCADC and still trying to guess the sneaky peak..driving me nuts...great card, the image is lovely.Thanks for the chance at winning your candy..yum yum. Gorgeous, gorgeous card!! Love the layout and soft colors!! Thanks for playing along with my flutter by challenge too!! Fabulous card and what fabulous candy. Already am a follower of the challenge blog (didn't wanna miss it). Thanks for a chance to win this awesome candy, Crystal. I became a follower of the SCADC blog! Hi Crystal! Oh goodness what an adorable card!!! I love your unique layout and stitching... the this image is so beautiful!!! You've colored her perfectly! Love it!!! Your candy looks yummy too!!! Have a wonderful week!!! Crystal your card is GORGEOUS!! A gorgeous, gorgeous card, Crystal! I love the colours and the butterflies are the perfect finishing touch! Oh how pretty Crystal!! I just love that image and your layout!! How fun is that and so creative!! Gorgeous coloring my friend!! Great candy too my friend!! I love the no fat kind!! LOL! This is really pretty Crystal, I love the image and the colours you've used look gorgeous. What a gorgeous image, Crystal, and your coloring is fabulous!!!! I'm off to go check out the new challenge blog...thanks for the link!!!!! What a beautiful card, Crystal! I love the layout and the image is so pretty! I became a fan of the new blog! Thanks for the chance to win! Thanks for showing me the way to SCACD.. :) Follower #182 :) And thanks for the chance to win your candy. Such a lovely card Crystal! Love the LO and great colors. I am now a follower of the SCACD Challenge. Have a wonderful day! I love your card and that image is great. Thanks also for a chance at some goodies! Thanks for joining us at SCH, your stitching is fab! Loving all the layers and great spring colors. Hope to see you again. PS- I have become a follower. What a fab card,such a pretty image! I have checked out the SCACD Challenge blog and become a follower.Thanks for a chance to enter for this fab candy. This is BRILLIANT Crystal! I LOVE what you've done with her. Hope you have a FABULOUS week my friend! Gorgeous card! And I just became a follower over at the new challenge blog! Thanks for a chance to win! Fab card , have been a follower on the SCACD new challenge blog for a while now and am loving the sneak peak game , though I'm useless at it, and would love to win some copics to start my collection so have my fingers crossed and my toes too and your candy is fab too. Thanks for the chance. Love the new blog. Thanks for the chance to win! Gorgeous work with this stunning image, Crystal!! So very beautiful! This is absolutely gorgeous Crystal!! I LOVE the soft colors and that beautiful image!! I have joined the new challenge blog and thank you for a change to win your low-calorie candy! Have a wonderful Monday! Oh this is so gorgeous Crystal! What a beautiful image and I love all the butterflies! Thanks so much for joining us over at the Tellen's Place texture challenge. Good luck and I hope you will play with us again! Very pretty. Love all the layers with the stitching and the bright happy colours. Thanks for joining us at Sugar Creek Hollow. Super cool layout Crystal. Oh I love that image. Sweet image and lovely Spring colours. Thank you for joining us at Rainbow Lady's Challenge this week. What a pretty card Crystal! She's is beautifully colored! I love the layout and colors. Hope you have a great day! So beautiufl and full of fresh spring colors... :) Great work again Crystal..you rock!! what lovely pastel colors on this Crystal! Such a pretty card! I love the soft pastel colors and the unique layout! What a fabby prize! Just checked out the challenge blog you listed. So many wonderful creations! Hey girl! GORGEOUS creation!! I'm a follower of the new challenge blog :) Looks exciting! Thanks for the chance to win some awesome candy my friend! What a beautiful card. I love the colors you used. THanks for joining us at Stamping With The Dragon. Beautiful card Crystal, I love the soft colors and the butterflies. I'm now following the SCACD challenge blog. this is gorgeous Crystal!!! love the colors too! Very pretty card. Thanks for joining us at Tellen's Place. This is beautiful, Crystal! I love the scattered butterflies. I don't think I ever told you but congrats on being on Susana's team!! Looking forward to seeing more of your lovely work with the SCACD stamps! I went over ther and I'm now a follower of the challenge blog! My next step is to see where the store is and what stamps they have as for to determine if I can participate in a challenge soon! Love the Card. Great colors. Thanks for the chance of winning. Great card. It definitely reminds me of Spring. Thanks for the heads up on the new challenge blog too. I can't wait to see what they have in store for us. Great candy! Thanks for the chance to win. Very pretty! Many thanks for taking part in the Mami Doodles challenge. Lovely card! Love the soft colours. Thank you for entering the FFF "Oh, So Spring" challenge! Good Luck, hope to see you again the next challenge, too! :)) Happy weekend! I would love to enter your candy, too - thanks for the chance! And I checked out the new challeng blog - looks great!! This is a sweet one! love it, love it, glad I stopped by. Thank you for the chance to get this candy. hi! beautiful card and yummy candy. im a follower now. thanks for the chance. have a wonderful day! Beautiful card Crystal! And I've already signed up at the new blog! Crystal, your card is beautiful. I am so excited to see the challenge blog for SCACD. I love these stamps!! WOW!!! This is really some wonderful candy.. Thanks for a chance to win..